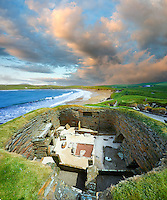 Images, pictures & photos of Skara Brae, Europe's most complete Neolithic village. A UNESCO World Heritage Site. In the winter of 1840 a huge storm hit Scotland killing 200 people and wide devastation. The high winds and waves lashed the bay of Skaill in the northern isle of Orkney and when the storm had abated the outline of houses could be seen on a low hill at the back of the beach known as Skerrabra. In the manor house close by lived the local laird, William Watt of Skaill. He stared excavating the houses but in 1868 he lost interest and stopped work leaving the four house ruins he had uncovered as a play ground for his children. 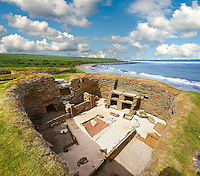 It was not until 1927 that the site was investigated by University of Edinburgh's Professor Vere Gordon Childe, and what he discovered was the Pompeii of the Neolithic period. 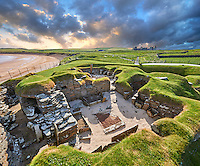 The buildings of Skara Brae were round stone built dwellings which would have had wooden pole ceilings covered in turf. Inside the dwellings were stone furniture, hearths, stone troughs & beds. The buildings were in such good preservation that Childe dated them at about 500BC. It was not until 1972 that radiocarbon dating stunned the archaeological world by revealing that the first occupation dated from around 3180 BC. Today it is possible to walk around the village and look down into the houses. The scene is one of domestic comfort with features that are very familiar. The entrance to the rooms was by a low tunnel door which had a door which could be locked with a sliding wood bar. At the opposite end of the round room was a stone dresser where trinkets were found. On the right side of the room was a large bed and on the left a smaller one. Stone partitions surrounded the beds within which bracken and animal furs would have been laid. Set into the floors are stone troughs which may have been filled with water to hold the bait of the fishermen that lived in these houses. Stone seats and cupboards added to the comfort of the houses which also had a drainage system and a toilet pit outside each house. The roof was covered with turf making it weather resistant. The piles of shells found outside the houses indicate precisely what the diet of the villagers was. 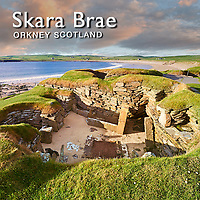 The reason Skara Brae was abandoned is a matter of much discussion. The most likely theory is that the weather became colder and the fishing became harder making it impossible to live on the islands. 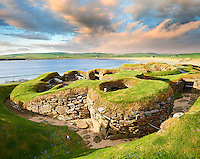 Standing above the little houses of Skara Brae it is possible to get an insight into Neolithic living. Looking out into the bay of Skaill it is not hard to imagine the boats on the beach of a thriving fishing community. This was though a sophisticated community that could also build great monuments and burial chambers and were almost certainly in touch with the other settlements of the Neolithic world.